This talk was organized ten days before the anniversary of the murder of three Muslim students Deah Barakat, Yusor Abu-Salha and Razan Abu-Salha. Islamophobia is rooted in US forieng policy in the Middle East and domestic policies affecting Muslims and peopple of color. MERI was launched in early 2015 to develop an intersection movement that challenges Islamophobia, anti-Black racism and other forms of oppression. 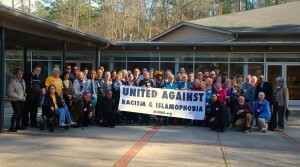 MERI offers presentations and workshops on understanding roots of Islamophobia and how to challenge it. MERI works with 14 partners to develop a grassroots movement against Islamophobia, racism and other forms of oppression. Helping to create a more just world is integral to the mission of ERUUF and to transforming lives, including our own. The ERUUF Justice Council coordinates action and activities for social, economic, and earth justice. The council is an umbrella committee, comprised of representatives from ERUUF Action Groups and other interested ERUUFians working to live the mission of the Fellowship.